It doesn’t happen often in the music industry, but sometimes talent can be handed down from parent to child. I can’t think of a ton of examples, but today’s band sees one of the greatest icons in folk rock history pass down a bit of his chops to his son—boosting the number of albums sold within the family. Jakob Dylan was born in 1969 to mother Sara and father, Mr. Bob Dylan. Born in New York but raised in Los Angeles, Jakob was exposed to lots of music at a very young age. He was mainly influenced by English rock acts, such as The Clash that piqued his interest in creating his own band. While he moved back to New York at 18 to pursue art school, a long-time friend started a band back in LA. Completing only one semester in art school, Jakob moved back to join his friends band, at the time known as The Apples. After playing a few smaller gigs in the area (including various times playing inside a local Jewish deli) they decided to reach out for a keyboardist. They found a good player nearly right away, changed their name to the Wallflowers, and they were on their way. The band made their debut album in 1992 under the Virgin Records label. It was widely regarded as a great debut and they toured with some major acts around the U.S. Despite that, sales were slow and they split from the label. They headed back to LA, hat in hand, ready to play local shows again. Eventually they caught the ear of Jimmy Iovine at Interscope in 1994 and almost immediately began recording their second album, to be titled Bringing Down The Horse. The band wanted to record everything live, which simply isn’t the standard anymore. Everything is done on computer and mastered. Because of this, they had a hard time finding a producer for the album. Once they did, and the album was wrapped up – the buzz started to generate. The album came out in May of ’96, and today sits at over 7 million sold worldwide. When the album came out, it was very different compared to the tail-end of the grunge revolution happening at the time. It was poppy, but not in the traditional sense. It had some elements of pop, rock, and a little folkish as a hat tip to the master, Bob Dylan. 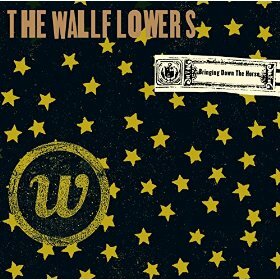 I don’t think anyone is going to argue The Wallflowers changed music history like Bob did – but there is something about this album that just gets the toes tapping. It’s catchy, but the song writing is deeper than a simple pop album. It feels like a great story-teller album, but also one you can sing along with in the car. It’s fairly easy to see why this sold so many copies, but hard to understand why the band could never replicate its success. This album is a staple of the mid-‘90s. For a solid couple years, you couldn’t go anywhere without hearing the many singles of The Wallflowers. Take your $5 bucks today and take yourself back to whatever you were doing in that era. Well worth it.